Since the invention of the electronic calculator, digital technologies have been an integral part of the banking industry, with successive generations of technology continually improving the customer experience and streamlining internal operations. Today, we’re witnessing a new generation of digital banking, as branches upgrade their corporate and customer-facing infrastructure with the latest audiovisual (AV) technologies to improve floor space utilisation and employee productivity, deliver automated in-person services and attract new customers into branch locations. 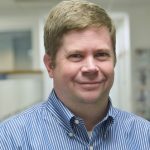 Avixa‘s Brad Grimes highlights five ways AV tech can help banks transform internal operations and customer experience. Video calls have quickly become a favored mode of communication, and Bank of America’s Advanced Centre branch concept capitalises on this trend with its digital concierge and private rooms equipped with always-on videoconferencing systems. When a customer enters the branch, the digital concierge automatically detects that arrival and offers to connect the customer via video with a call center bank employee who can address their basic banking needs. The private videoconferencing rooms then allow customers to speak with local and national experts to discuss auto loans, mortgages, retirement and more. This helps to ease on-site staff requirements while providing customers with access to remotely located experts visitors otherwise would not be able to contact. 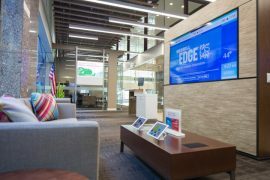 While videoconferencing lets banks provide enhanced personalised services, large format LED display technology helps branches connect with their customers’ community and culture to foster deeper, more loyal relationships. To draw in new customers and engage existing ones, Bank of Hawaii recently unveiled a large-scale 10m x 2.2m, 3mm pixel pitch LED wall at its flagship “Branch of Tomorrow” in Honolulu. The result is a unique lobby environment where local culture is promoted through life-size high-definition Hawaiian scenes, interspersed with bank promotions and product information. The high visibility and attention-grabbing size of the LED wall helps position the company as forward-thinking and technologically adept, while connecting directly with the local customer base. 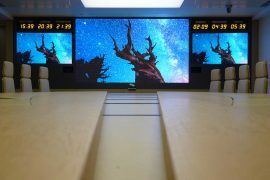 On the internal business side, banks and financial institutions are increasingly installing large LED displays and video walls in conference rooms and public spaces that leverage the technology’s enhanced resolution, brightness, contrast, and off-angle viewing characteristics to present financial data, stock tickers, meeting information, images and video as clearly as possible. The European Investment Bank’s recently renovated Luxembourg headquarters embodies this reality, with meeting rooms and boardrooms now utilising LED displays that are brighter and more reliable than older display technologies. The bank also updated its London facility with 1.6mm fine pixel pitch video walls in strategic locations. The tile-based displays deliver nearly 4K resolution with no bezels, making them ideal canvases to improve information communication throughout the facility. Looking beyond customer- and employee-facing technologies, banks are also using the latest AV control systems, which are operated through simple mobile apps, to manage interior and exterior lighting, sound reinforcement, motorised window shades and HVAC systems. 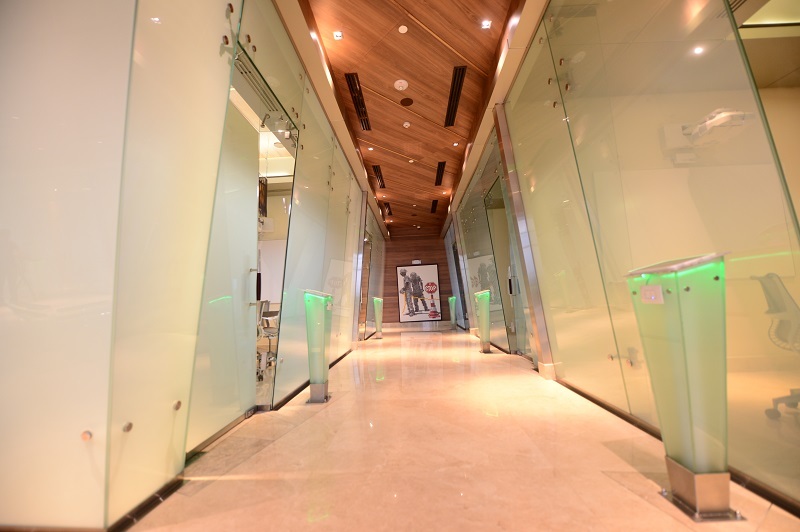 Capital Bank Tower in Panama’s financial district uses fully-automated centralised lighting to maximise energy efficiency and provide custom lighting options at the touch of a button. Similarly, meeting room windows can be shaded automatically based on time of day, or on command, to give employees privacy or block out unwanted external light. Special VIP meeting rooms feature an outside pedestal that glows green if a room is free or red if it is occupied and houses a touchscreen to manage room use. While Bank of Hawaii’s Branch of Tomorrow dips its toes into local culture and community, PNC Bank’s free-to-use Fairfax Connection in Cleveland jumps in with both feet. The self-described community center isn’t a bank at all, but more of a learning institution where audiovisual technologies deliver programs that promote financial inclusion, technology education, arts and cultural heritage, and small business development. A digital production studio allows young adults to use state-of-the-art computer and editing equipment to create content that preserves the community’s cultural heritage, while an area with a large LCD touchscreen lets visitors add personal photos and stories to an interactive Google Earth map of Fairfax. The giant touchscreen is also used for the PNC Grow Up Great initiative, which aims to help young children develop a lifelong passion for learning by connecting with leading experts in diverse fields, such as a session with the Centre for Puppetry Arts in Atlanta. Adults are encouraged to use the available computers to apply for jobs, stay in touch with family, or build small businesses. The Fairfax community overwhelmingly appreciated this technology and learning center, leading community members to actively encourage PNC to open a branch in their neighborhood. PNC also found certain aspects of the Fairfax Connection could benefit their bank branches, and now deploys community screens at various locations that help customers connect more deeply with local history and heritage. AV technologies are opening new doors for banks and financial institutions to improve customer and employee engagement, community involvement, brand loyalty and internal operations. To compete in the modern industry landscape, it is imperative that banks leverage these technologies to provide more engaging experiences and relate to the needs and expectations of today’s technologically-demanding consumers. From large LCD touchscreens and LED video walls to videoconferencing rooms and building automation systems, the banks of tomorrow will be more technologically driven than ever before. 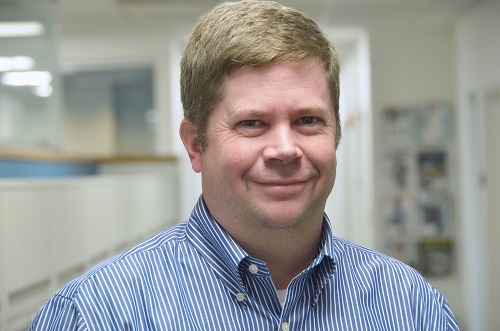 Brad Grimes is senior director of communications for the Audiovisual and Integrated Experience Association (Avixa). Avixa represents the $178 billion global commercial AV industry and produces InfoComm trade shows around the world.